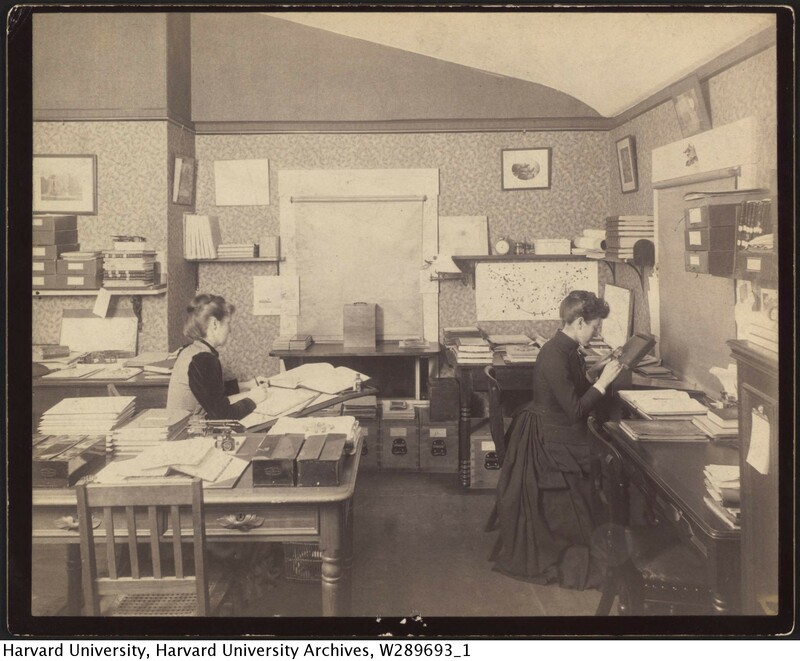 This is a personal project collecting and documenting early images of Harvard College Observatory, focusing on the site at Observatory Hill (previously Summer House Hill). Buildings, instruments, people, and observations. Disclaimer: all content here is solely my own views, and in no way represents the views of my employer, or anyone else. Also, I'm documenting things as I learn about them, so expect frequent errors. Corrections will occur without notice and without a changelog at this point. This page shows a list of all images tagged with "women". 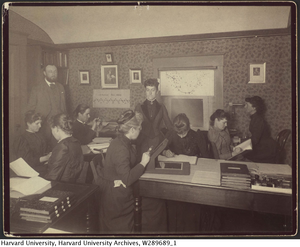 A group photo of computers at Harvard together with Mary Anna Palmer Draper, aka Mrs. Henry Draper. She's seated in the middle. 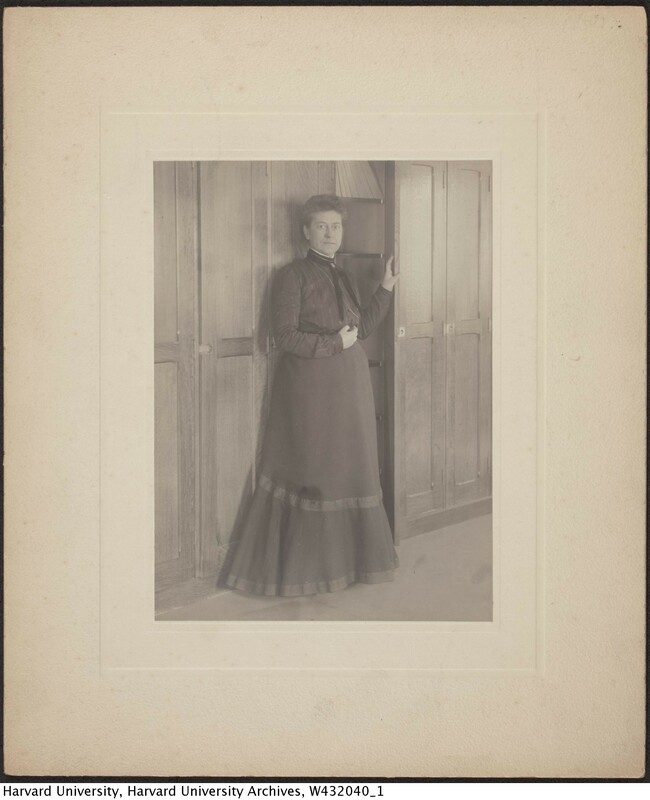 After her husband's death, she contributed a significant sum of money to continue her late husbands' dream of scientific astrophotograpy, leading to the Draper Catalog, an ambitious project of the Observatory. Many, though not all, computers were funded for this project. Harvard dates this as 1891. It seems to be approximately the same time as other photos with similar groups of women, taken in the same room. I think there were two pairs of photos taken on different days. 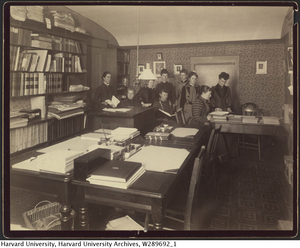 The photo was taken in the long computing room (see 1876 floor plans) on the south side of the second floor (the top floor, excluding the dome) of the building. The photograph was taken facing east, and the doorway in the photo is the closet shown in the floor plan. Note that Stevens is Mrs. Fleming's maiden name, and she did have other relatives in Boston, but so far I don't know if any of the other Stevens that worked at the Observatary are related. 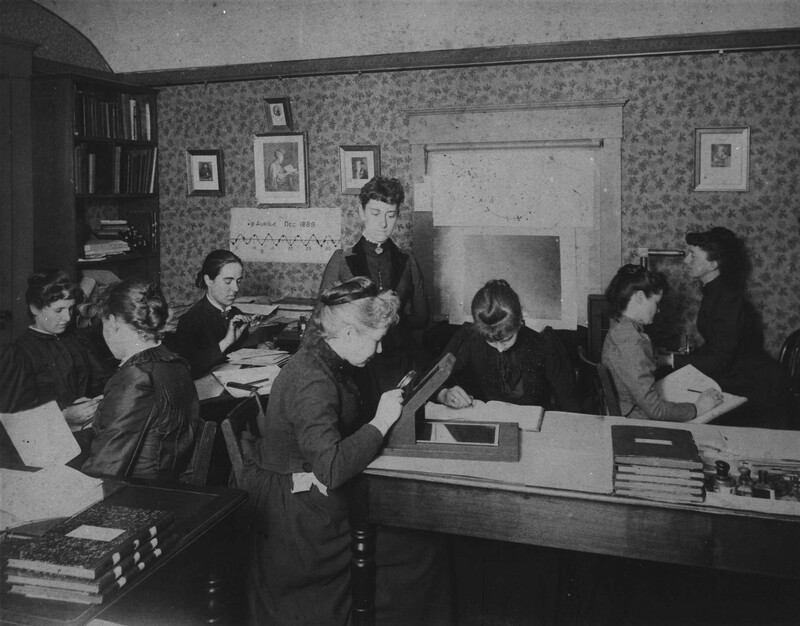 General: The women depicted in this photograph analyized stellar photographs and computed data at the Harvard College Observatory. Another photograph taken in the same place and on the same day as the previous, with the same people. Computers in one of the computing rooms at the Observatory. 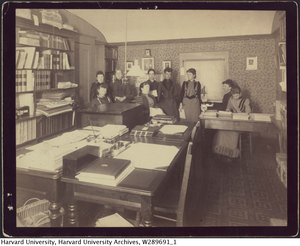 Harvard's date of 1891 for this photo is probably pretty accurate. It has to be after Dec. 1889, based on the graph on the wall of β Aurigӕ, just behind Antonia Maury (who is credited for discovering that it is a binary star). And as it was published in an April 1892 New England Magazine, thta's the upper limit on the photo. This is the same location as the photos with Mrs. Draper and some of the computers, the larger computing room on the top floor of the west wing of the Observatory. Nearly the identical photo as the previous, but with Pickering added standing on the left. Obviously taken the same day. Note that the women did not work this closely. As can be seen in the above photos with Mrs. Draper, the room is larger and they are crowded together for sake of the photograph. 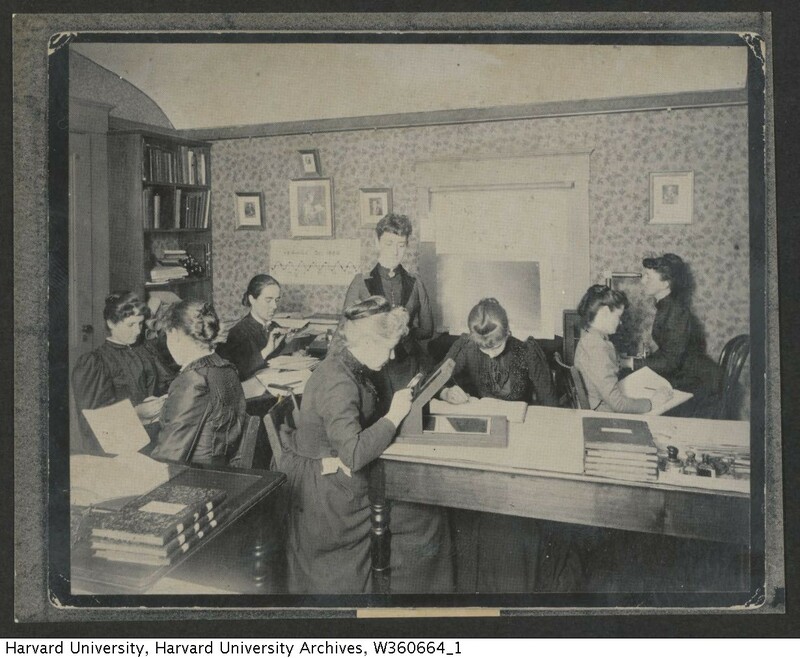 There were between three and five rooms total for the computing work, and by my best guess about 15 women worked there at that time, as well as at least five men. Still cramped, but not this cramped. The following year, a brick building was constructed to help out with the space issues. 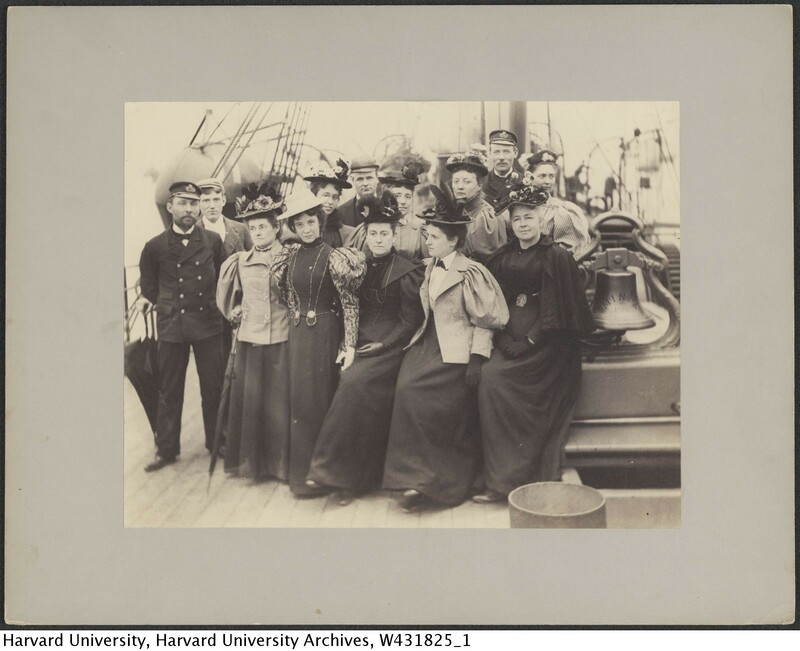 I think this is Williamina Fleming, seated on the right. The woman on the left may be Mabel C. Stevens, and she's wearing the same dress as one of the women of women computers in the old building with Fleming. Fleming appears to be wearing the same dress also, but without the jacket. This photo was taken on the same floor as that other photo, but in a the other computer room at the oppisite side of the building. 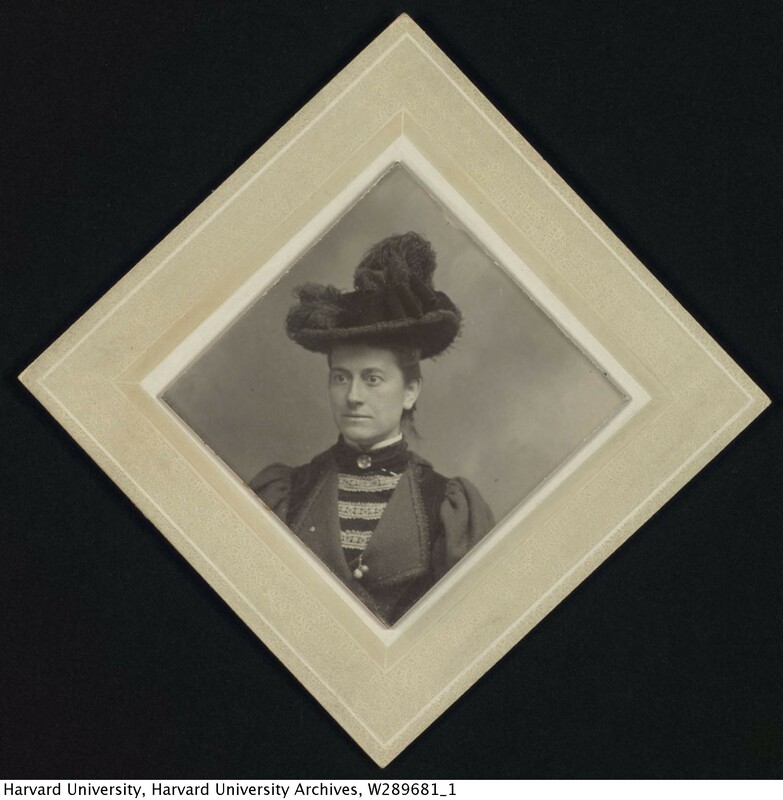 I have a small suspicion based on her appearance in other photos that this photo may be much earlier than Harvard's 1896 date, but so far nothing to back it up. 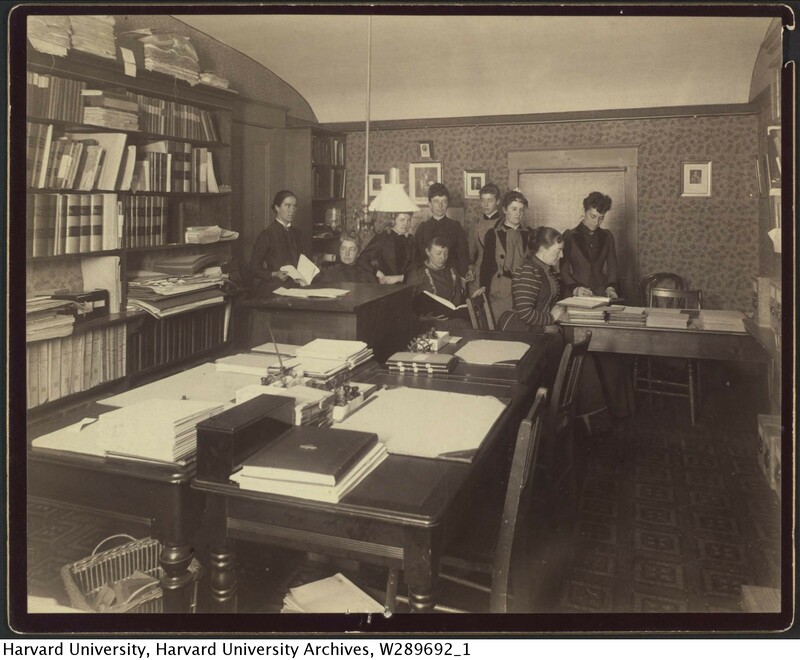 Use/Copyright: Radcliffe College Archives: This image may not be reproduced or transmitted in any form or by any means, electronic or mechanical, without permission in writing from the Radcliffe Archives. Women computers working (or posing as if they're working) in a room in the new brick building, built in 1892. I've dated this photo to March of 1898 based on a calendar visible in the image. The year is not actually legible, but it's a year in which the first was a Tuesday. It also appears (not very clearly) as if the calendar is marked with quarter moon phases, and based on this interpretation, it can only be 1898. Williamina Fleming is standing. 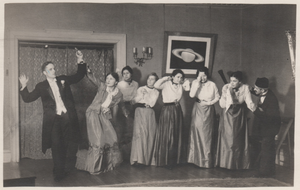 Immediatly in front of her are Eve Leland (back row center) and Ida Woods to the right. 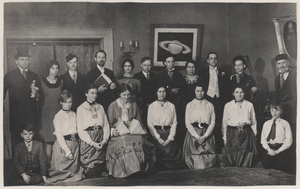 The rest are unidentified, although the woman closest to the camera could be A. J. Cannon. 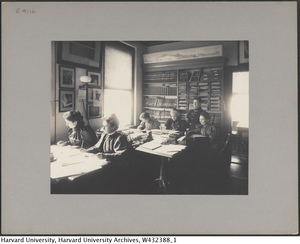 Note: Harvard identifies this as a photo including Henrietta Leavitt. She does not appear in this photo. 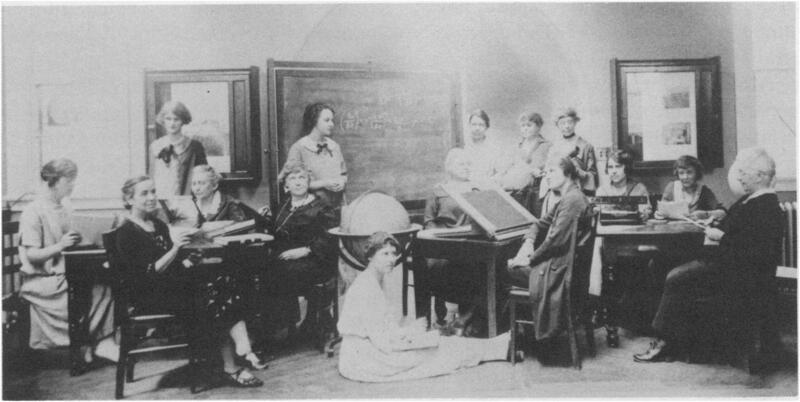 A group of women, most or all computers from the Observatory, on board the C.S. Minia, a cable repair ship. 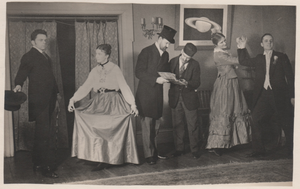 On the early end for possible dates of this picture, Mabel Gill (holding Fleming's hand) was hired in 1892 (assuming she had been hired at this point). At the other end, Fleming passed away in 1911. The Minia became famous as one of two ships primarily responsible for picking up survivors (and bodies) after the sinking of the Titanic in 1912. Before that, the Minia was a well-known ship under Captain Trott, also well-known for his ability to find and repair broken transatlantic telegram cables, in the deepest seas and the worst weather. He was also known for his hospitality when in port, and this photo could simply have been an opportunity to visit the ship, although he is not one of the gentlemen in this picture. William Squares DeCarteret took over as captain in 1899 after Trott passed away, and James Adams became his chief officer. 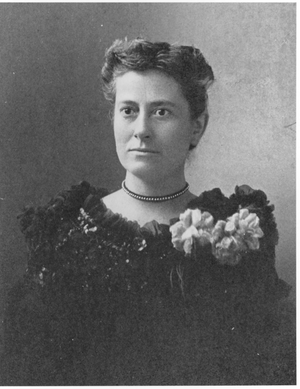 In her 1900 journal, Williamina Fleming specifically mentions a letter from "Captain Adams" about the Minia. James Adams did eventually become captain of the Minia but it seems to be at a later date. At any rate, Miss Fleming apparently had some direct connection with an officer on the ship. Another possible connection would be the Observatory's early interest in telegraphy; they might have had much more direct contact with the ship than your average telegraph customer. Transatlantic cables were used for clock synchronization and precise longitude determinations from the very beginning. In 1873, Joseph Lovering published On the Determination of Transatlantic Longitudes by Means of the Telegraphic Cables. Also, Captain Trott and at least one crewman were members of the Nova Scotia Institute of Science, which sent their proceedings to the Observatory, so it's possible there were other connections between this ship and the Observatory also. *I found photos of both captain De Carteret and Adams, and I think it's at least possible that these men are those men, but I may have them reversed as they look like brothers to me. **I think it looks more like Cannon, and I want it to be her because I actually have no other images (besides very large group shots at conferences) with Fleming and Cannon together. BUT, reasonable estimates of this photo's date would put Cannon in the 35 to 40 range. If this is her she certainly looks MUCH younger than the 1902 photo I have of her. Williamina Fleming at Harvard College Observatory plate stacks. These are the "new" plate stacks in the brick building addition, built in 1902. 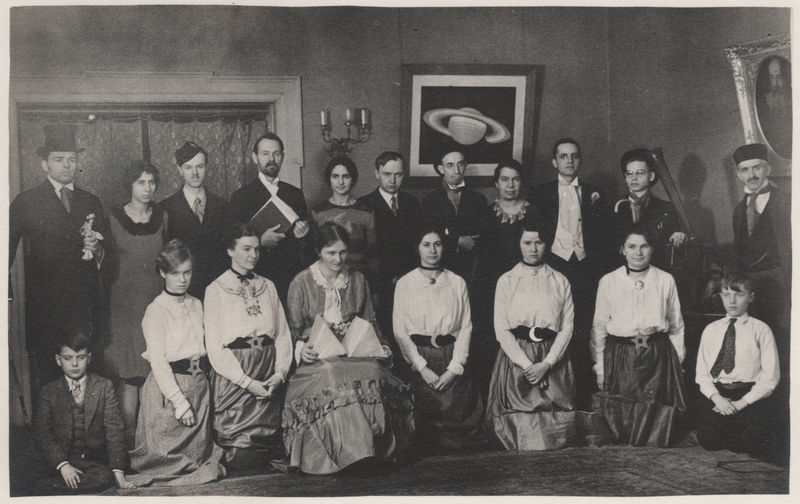 Harvard calls this photo "Observatory Group", ca. 1910. The Internet often calls it a photo of "Pickering's Harem". I think it's from mid-1911. The lack of Williamina Fleming certainly makes it likely to be after 1911 when she passed away, and Henrietta Leavitt, also absent from the photo, was out of town until late 1911. The photo was taken in the front of the Astrophotographic Library aka, the "Brick Building", aka "Building C."
"Pickering's Harem" may be a modern sexist invention rather than a historic one. I've found no references earlier than 1976 for this phrase. On the other hand, they were much more polite about what the wrote down back then, so it may just as well be a real nickname passed down by oral tradition. I believe the correct names for two of these are "Mary H. Vann" and "Dorothy Block".jaavsoharwood Also, I think this is Mabel, not Edith Gill (or the few other labelled photos I've seen so far similarly mislabel the presumed sisters). For the longest time I didn't know where pictures like this one were taken. This is an addition to the director's residence added in about 1893 that maybe doubled the size of the residence. The building is not curved, and the brick building to the right is the end of the astrophotographic addition, lying in the same plane. The wide angle just makes it look like a 90 degree bend. I have no information on when or where these photos were taken (but I did learn about foil traceries and cinquefoil arches). But she seems fairly young, so I'd guess close to the same time as her doctoral thesis. So about that thesis. The way the story is conventionally told, Ms. Payne discovered that the Sun was mostly made of hydrogen and helium, but THE MAN (Henry Norris Russell) wouldn't let her announce those results. Allegedly because of him she published her hydrogen and helium results as "almost certainly not real". While she did use that quote, the evidence for the rest is lacking - no letters [edit- actually there is one, although there are context issues], no early copy of her thesis. And most importantly she doesn't mention it in her autobiography, even though she is vaguely critical of Russell for other reasons (though overall she respected him deeply as a mentor). Here's the story as I would tell it (danger - we're venturing strongly into opinion territory). Cecilia Payne published a revolutionary thesis in 1925 called Stellar Atmospheres. What she did was both ground-breaking, and fundamental to all stellar astrophysics that followed. Spectrum analysis was very important in astronomy because it could tell you what stars are made of. 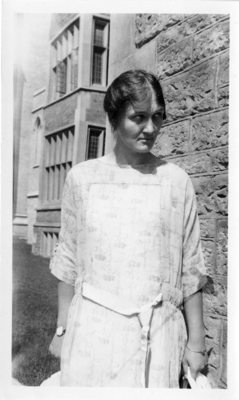 But until Cecilia Payne's thesis, what it couldn't do was tell you how much of each element was in the stars. Payne applied new theoretical models in quantum mechanics to the analysis of spectrums to estimate how much of each element was in the stars. She applied this method, and published the results. And the results show that, wow, stars are almost entirely hydrogen and helium. So why did she say "almost certainly not real" if not for THE MAN? The understanding of science in those days was that everything in the universe was made of the same stuff, which is to say, just like the earth. And up until Payne's thesis, stellar spectra confirmed this - stars were made of the same stuff as the earth. And in fact, setting aside the hydrogen and helium, the rest of Payne's results confirmed this prevailing view - the ratios of elements in the stars matched pretty well with what was on the earth. So pretend you are a scientist, a real scientist who's work is accepted by and respected by your peers. And you discover something completely unexpected and unexplained. Do you shout a complete change in orthodoxy from the rooftops, or do you publish a very cautious note about your unexpected result? If anything, Payne was brave to include the unexpected results at all, even with the "not real" notation, as there have certainly been other scientists who've simply left out unexpected data points. This then, is why I don't like the conventional retelling. It belittles Ms. Payne's role of a responsible, professional scientist, simply to make an inappropriate point about THE MAN. If Russell did advise her to add that note, it was good advice, but I prefer to think that she was smart enough and professional enough to have published her results this way anyway. Also, it encourages us to think of all past men as neanderthals, rather than living, breathing individuals. 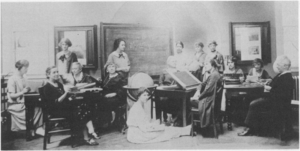 While sexism in general was certainly much worse then, the astronomical community was an exception, generally accepting of women as respected contributers (no doubt in part because of the legacy of Pickering's women computers). And within that community she'd found an even rarer exception at Harvard Observatory, with a small group of men and women who were actually encouraging women to advance as equals. Of course, having said all that great stuff in defense of men of that era, it was only a small bubble she was in. All the friction outside that bubble held her and all women back. Let's look at THE MAN from that story. 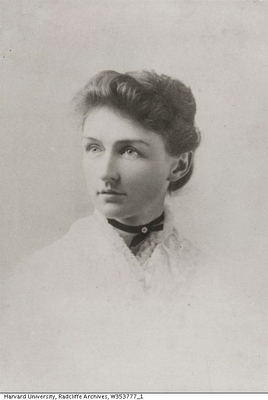 Her Mentor, Henry Norris Russell, was not at Harvard, but rather at Princeton. Russell credits his math skills to his mother and grandmother, and he also helped Annie Jump Cannon get one of her honorary degrees, so really not THE MAN he's supposed to be in the popular narrative. But Russell sent his own promising grad student to study at Harvard, Donald Menzel. He did this for the same reason everybody did research at Harvard - their amazing collection of astrophotography and spectra. But in some sense, this also put Menzel in competition with Payne as they were doing very similar research. To avoid trouble Payne's advisor (and director of the Observatory), Harlow Shapley, split up the data (I don't remember exactly how). This was for Payne and that was for Menzel. In a telling turn, and one that resonates with lessons today about men and women competing in the modern world, Payne kept her crayons inside of her lines, but Menzel did not. He studied all the available data. Who made the right choice? I'm not sure, and I think in this particular case it didn't matter terribly much (she published an amazing thesis). 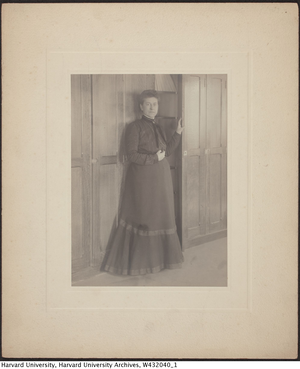 However in the long run, Menzel also ended up back at Harvard, and was a director of the Observatory, a position that Payne was never able to attain. But in my opinion this almost certainly had more to do with sexism at Harvard than it did with research choices they made as grad students. Ultimately as great as Shapley and Russell and others were for her career, there was little they could do to overcome the deeply rooted sexism in the wider world. Nor should I overstate the acceptance within the astronomical community itself. It may have been ahead of the rest of the world, but people are always products of their times. Sexism was inescapable. Harvard says the caption is "As We Were" in the upper left corner, but they must not have scanned that or it is on the back. 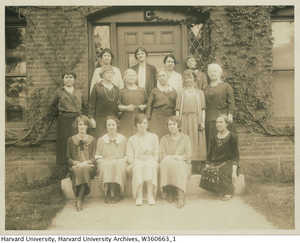 This is an amazing photo crossing generations of women at Harvard. It's the end of the era of women computers, and the beginning of the era of women scientists. I found a source identifying the names. Ceclia Payne's expanded autobiography.paynerecollections My guesses were all correct (I skipped five of them). I've only just now noticed that these women are all wearing the exact same outfits as in the other 1925 photo above "As We Were", and so both photos were probably taken on the same day. They appear to be the same set of women, and based on that I've put in the five names I hadn't figured out. 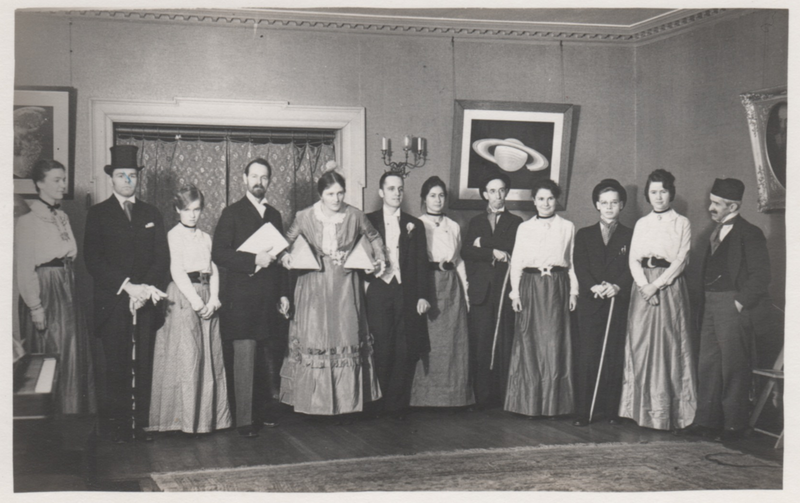 A set of six photos of the Observatory Pinfore has recently turned up. 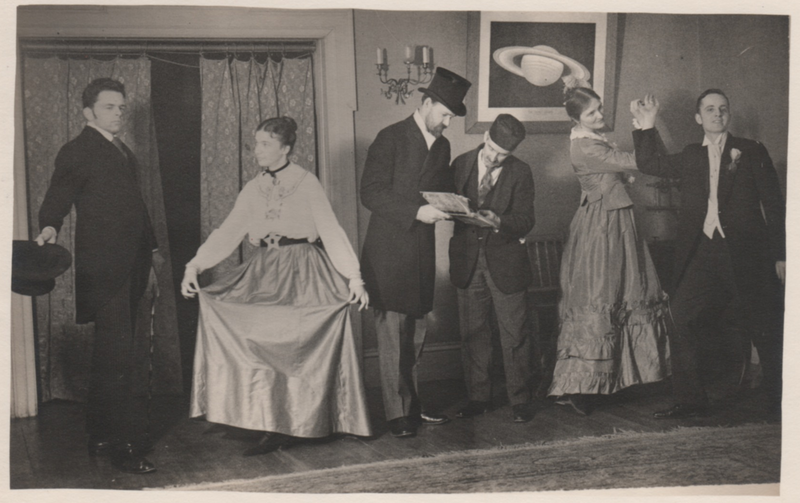 They've been scanned by their owner, Charles Reynes, who's the great grandson of Edward Skinner King (who was almost certainly at the performance - he's in the group photo for the AAS conference where the play was staged). They are by far the best quality images I've found anywhere of the performance, and three of them haven't been found anywhere else. I'm having a particular problem with two identifications from these photographs: G. W. Wheelwright as Winslow Upton and W. R. Ransom as Pickering. I'm hoping to identify the characters from the context of the photos, but at this point I'm not sure that will work. From the opposite end, I've attempted to find photographs of both Wheelwright and Ransom in other contexts. Neither seems to look at all like the character in the photos with the more recessed chin. 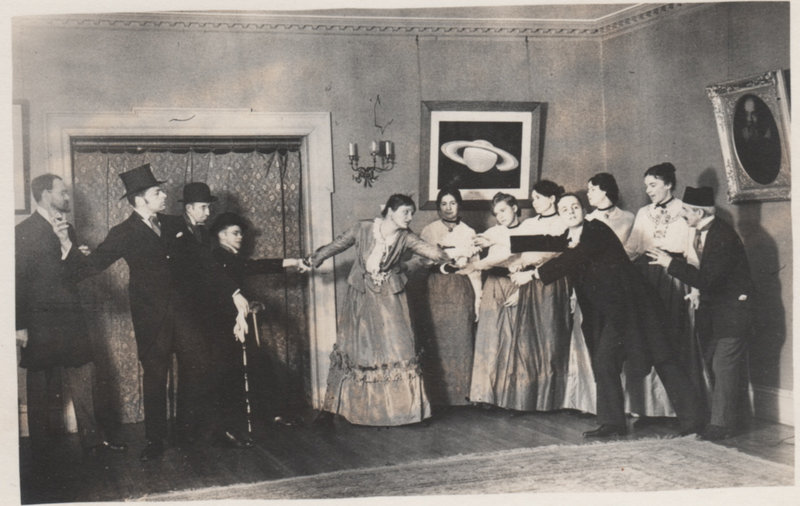 Adelaide Ames (as Rhoda G. Saunders), Bart J. Bok (as Leonard Waldo), Mildred Shapley (as computer), Unknown, Cecilia Payne (as Josephina McCormack), Peter M. Millman (as William Augustus Rogers), Henrietta Swope (as computer), Unknown, Helen Sawyer (as computer), Arthur R. Sayer (as F. E. Seagrave), Sylvia Mussels (as computer), Leon Campbell (as Arthur Searle). A scene from the Observatory Pinafore performance, perhaps dancing. 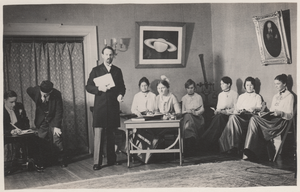 A scene in Observatory Pinafore, where Josephina stops Professor Rogers from killing himself in despair over the defection of his helpful assistant, and circle reader, and whatever else. This image is the most widely available image of the performance. Peter Millman, Cecilia Payne-Gaposchkin, Henrietta Swope, Mildred Shapley (daughter of Harlow and Martha Shapeley), Helen Sawyer-Hogg, Sylvia Mussells-Lindsay, Adelaide Ames, Leon Campbell. These identifications come from the copy of this picture in the Emilo Segre Visual Archive. I've based some of my own identifcations on this list. 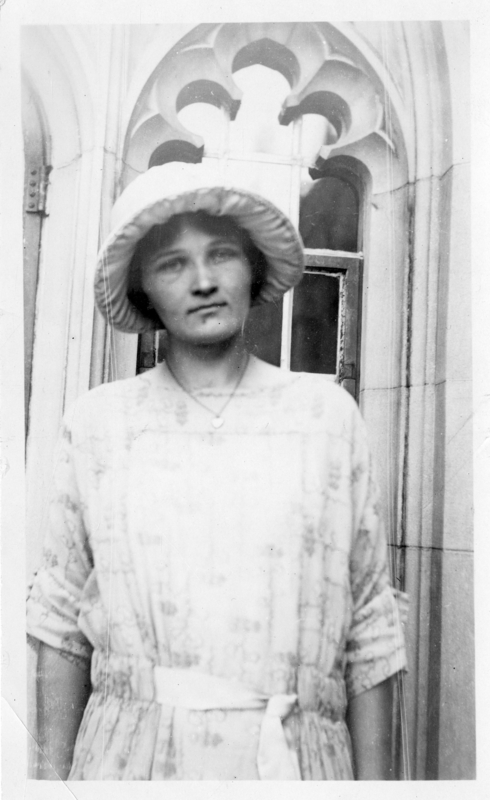 This is my only source for Mildred Shapley and Sylvia Mussels, all the other faces I've found in other photos (to varying degrees of a satisfactory match, but at least enough of a match to improve my confidence that they're correct). A scene from the Observatory Pinafore where Josephina is being pulled away from Professor Rogers by Seagrave and the men of Providence. I believe this is the point in the play where Josephina is led to the "dungeon". 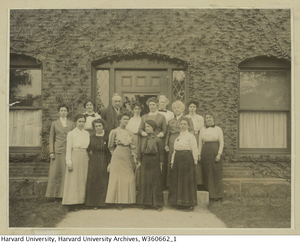 Unknown, Bart J. Bok, Unknown, Arthur Sayer, Cecilia Payne, Henrietta Swope, Mildred Shapley, Helen Sawyer, Sylvia Mussels, Adelaide Ames. 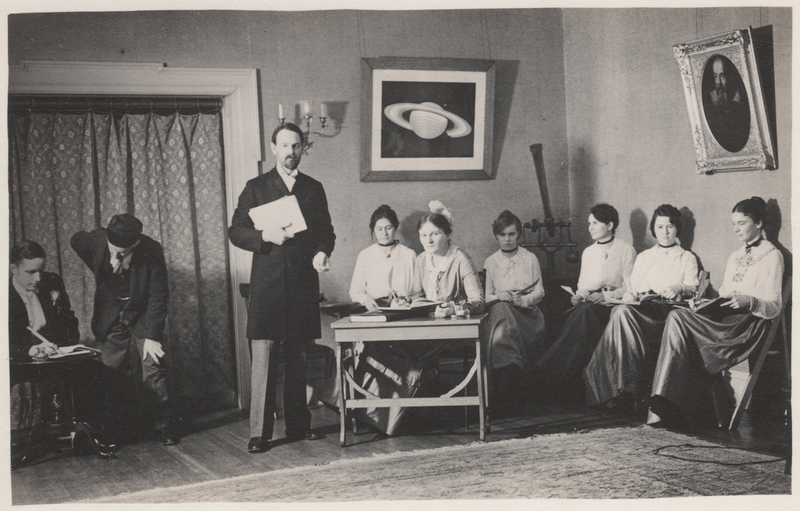 A scene from Observatory Pinfore, with Astronomers and Computers hard at work. Based on the people (and the books), this may be somewhere in the first scene of the play. 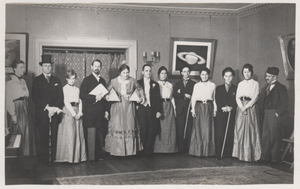 If so, this could be the Winslow Upton character standing, as the right set of people are on stage for Upton's reciting of "I know the value of a kindly chorus..."
The portrait of Galileo hanging on the right still hangs in the Observatory today; it is the copy by Carlton gifted in 1890. Historical: Williamina Fleming worked at the Harvard College Observatory. 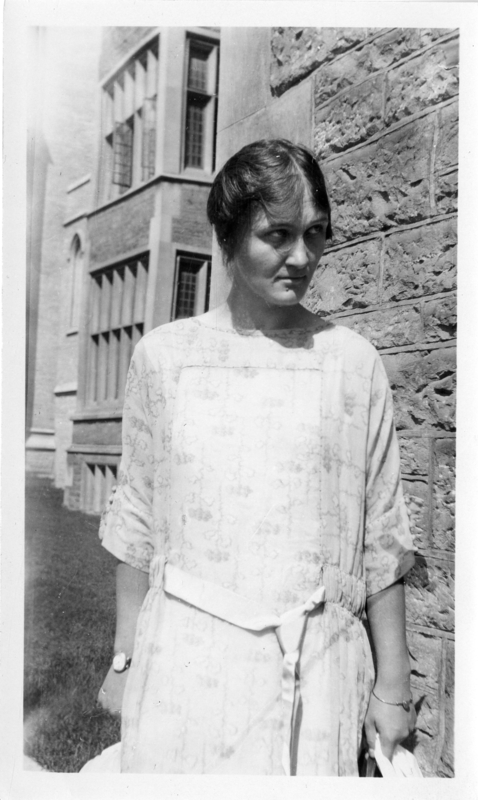 She analyized stellar photographs and computed data.